Improve the effectiveness of your service provision and resources, and the quality of your IT department. HelpdeskAdvanced is an ITIL v3 compliant web- and mobile-based solution governing services across all organisational areas where Service Management is a key factor in the successful achievement of your company’s objectives, operating efficiently and to high standards of quality. HelpdeskAdvanced is based on the principle of process automation, supporting the different strategic scenarios of service governance through the automation and enhanced configurability of IT and Business processes. 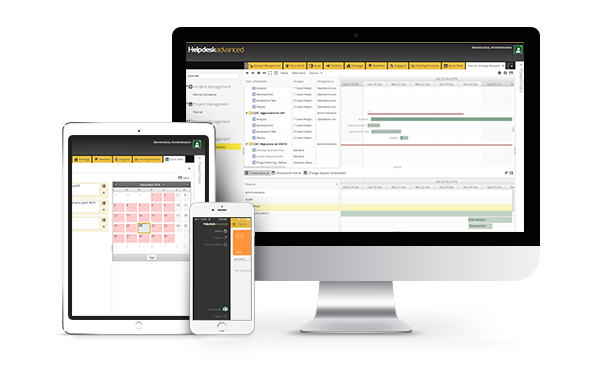 With HelpdeskAdvanced users can enjoy the best User Experience daily, facilitated by tools, channels and interfaces, as well as the mobile app which offers the main Service Management functionalities anywhere at any time. PAT, with its HelpdeskAdvanced solution, was cited among the top ten European companies Vendors and first Italian company in the Gartner Report "Magic Quadrant for IT Service Support Management Tools". HelpdeskAdvanced is designed to manage all kinds of assets and processes, not only IT-related ones. Its flexibility enables a high-level of customisation based on our specific needs. Use the Mobile app to manage and monitor your tickets, their status and the performance of your services. Choose the version that best suits your business needs: Cloud or On-Premise. HelpdeskAdvanced automates the governance processes of your IT and business services. Configure and adapt Service Management governance processes and functions to your business. Manage the IT Service Management LifeCycle in line with the ITIL v3 standards. Interact and work across channels, accessing information round-the-clock, including from mobile devices. Offer your users an immediate and round-the-clock self-service facility. HelpdeskAdvanced integrates with third-party solutions via web-services at the core of your corporate infrastructure. Share strategies and initiatives, actions and information to best manage the service for your users. HelpdeskAdvanced allows users and operators to manage the service in multiple languages.